Vietnam extends 3,444 kilometers (2,140 miles) from north to south. The long strip of terrain is home to numerous diverse ecosystems including gargantuan mountains, miles of uncharted rainforest, Mekong Delta swampland and a staggering 3,260 kilometers of coastline. As a result, latitude and longitude can be a good indicator of expected weather patterns. It’s hard to say what time of year makes for the best weather in Vietnam. No matter what time of year it is, both rain and clear, sunny skies can be found somewhere around the county. So, if you are planning to move around a lot, go ahead and keep reading. 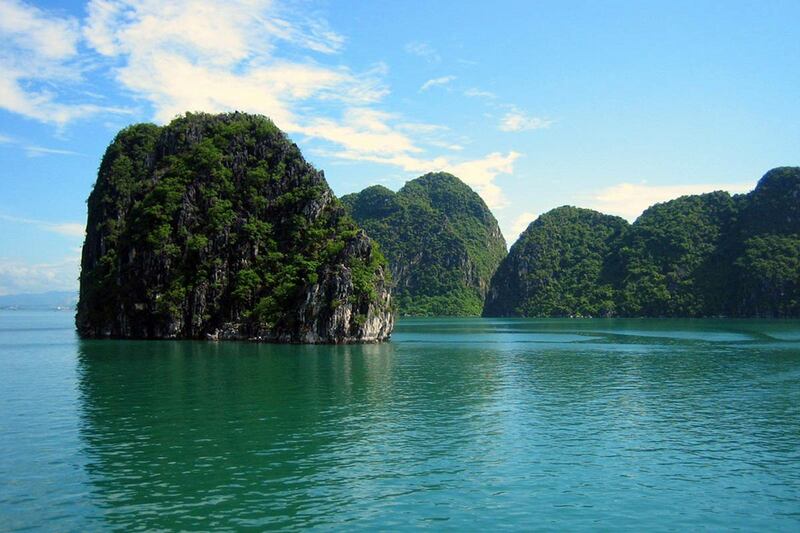 However, there is a some general consensus which suggests the best time to travel to Vietnam is from December to March. During these months, the typhoons have receded making way for much more favorable conditions. Both southern and northern Vietnam experience their own tropical monsoon seasons, although they occur during different months. The northern monsoon spell begins in October and comes to a close as late as April. Conversely, the southern territory’s season runs from April to September. Despite the fact that weather in Vietnam undergoes a monsoon season, this is not necessarily indicative of rain. Whereas the north will maintain a cool and fairly dry monsoon season, the south will become engulfed in a warm and rainy climate during this time. The far north is an extraordinarily mountainous landscape and home to the highest point in Indochina, Mount Fansipan, heroically looming at 3,143 meters. Due the high elevation, the weather patterns in the northern provinces experience much lower annual temperatures averaging 60 degrees fahrenheit, yet see noteworthy drops during the night hours. Occasionally, northern regions like Sapa, Ha Giang and Bac Ha can see light snow or flurries during December and January. Suggested time to travel: Dates falling between March and May and September to November provide an exemplary climate. These months consistently see sunny days and cool nights which make for ideal weather in Vietnam. The northern territories, unlike the south, are exposed to both a distinguishable winter and summer period. The winter season is very dry and cold, and temperatures average 16-21 degrees celsius. Typically, it lasts from November to March. July and August will see the most annual rainfall, and the official summer season spans from May to October. Suggested time to travel: It depends if you like hot or cold weather. So in other words…it’s up to you. 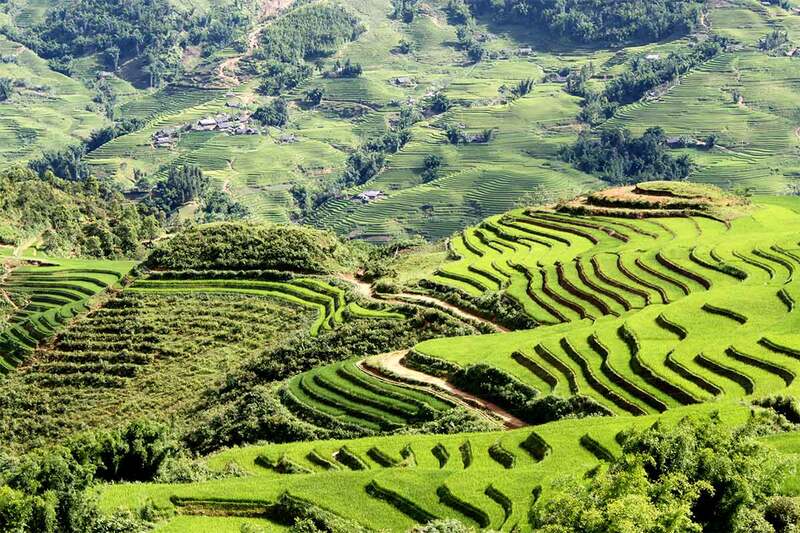 The weather in Vietnam, especially in the central highlands can vary greatly due to its elevation and the Truong Son mountain range makes for a vast difference of weather patterns between cities like Hoi An and Danang. From January to August, the area is choked with extremely hot and dry climates, but by time winter rolls around in October, the amount of rainfall increases dramatically. 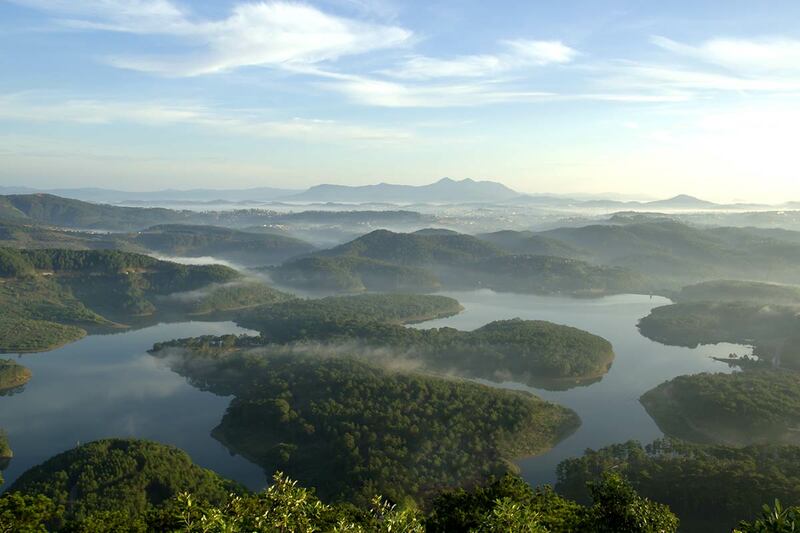 Dalat takes on much precipitation from June to October, and November to May presents a dry atmosphere. If you don’t like cold temperatures then perhaps Dalat isn’t the best destination at the end of year leading up to January. Suggested time to travel: November through January is bursting with greenery and an abundance of natural, colorful flowers. The temperature rests between 10-15 degrees celsius, making it slightly cool but still enjoyable. Unlike the variety of climates experienced in other provinces north of Ho Chi Minh, temperatures remain fairly constant and are broken down into two seasons; wet and dry. The wet season of the south takes place from May to November. The dry season begins in November and ends around May, while the wet season stretches from May until November. If you’re in the south, expect remarkably heavy, yet short lived rains. 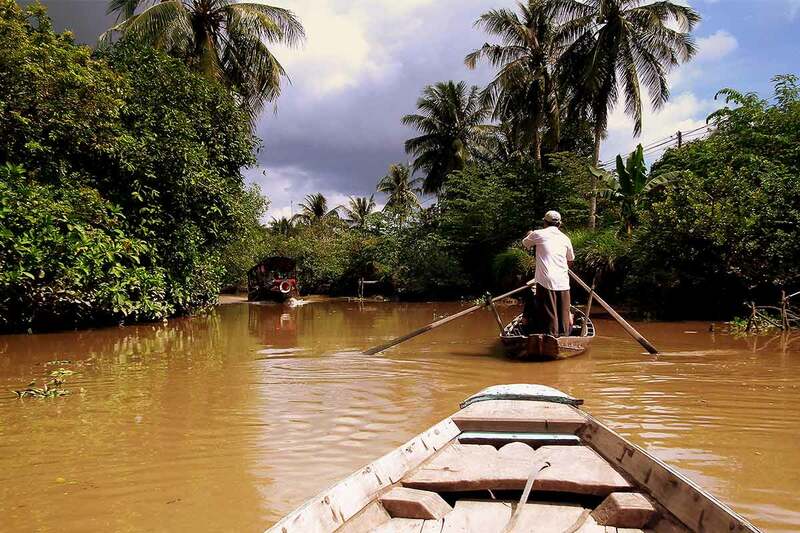 During the rainy season the Mekong Delta is hot and humid from April to September. Months that see the highest temperatures lie during June and July. During this time, expect loads of flash floods in and around Ho Chi Minh City. 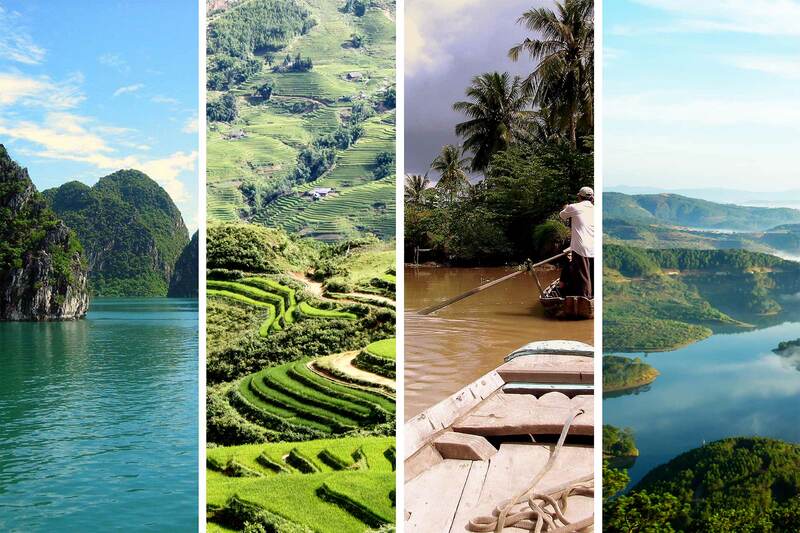 On the whole, the weather in Vietnam averages temperatures ranging from 25-35 degrees celsius year round. When booking, pay attention to the current trends of the weather in Vietnam. Plan your trip around preferred weather conditions, as well as the take into account all the different provinces you will be visiting during certain times of year. Just because it’s cold in one place, doesn’t mean it will be in the next. If you travel from top to bottom, make sure to bring clothes and footwear suitable for a wide range of temperatures and climates. Don’t forget to consider your elevation as it can drastically affect the temperature. If you drive a motorbike, remember that the wind chill drops greatly. A thicker coat, long pants, gloves and even a scarf are recommended when driving in the central highlands and northern areas. Trust me, I learned this the hard way. I’ve been left ill prepared because I didn’t pay enough attention the varied weather in Vietnam. January 26th, 2016 was the first time ever snow was recorded in Vietnam.